The Hawaii Statewide Intelligent Transportation System (ITS) Architecture is a planning document for the deployment of statewide ITS devices and systems in Hawaii over the next ten years. 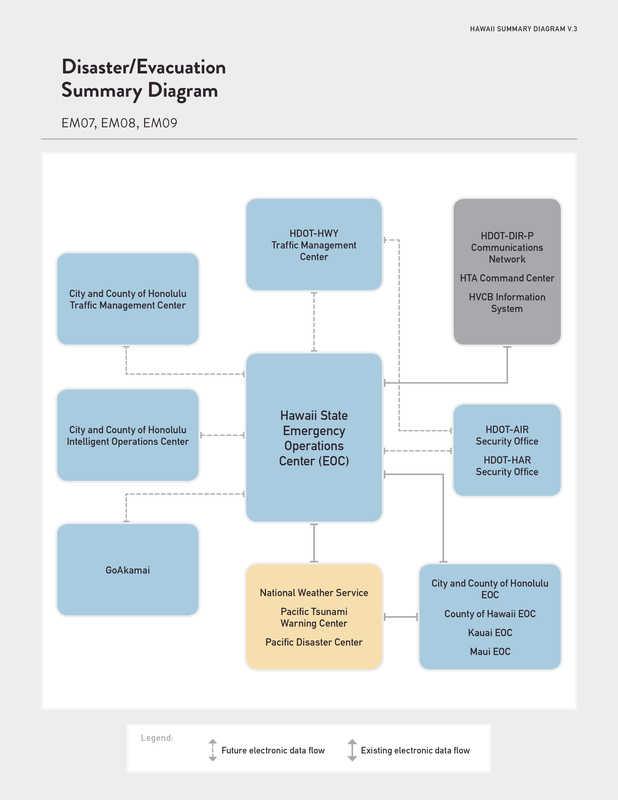 The Hawaii Statewide ITS Architecture covers ITS systems and services that are statewide in nature. The Architecture has been developed to support ITS project development as well as planning, data collection, and analyses functions for statewide transportation agencies, and those local agencies that connect to statewide agencies. The Architecture can be used by the agencies in meeting federal requirements relating to ITS Architecture and Standards as well as supporting the requirements of MAP-21 and State or individual County transportation planning processes. The development of the Hawaii Statewide ITS Architecture began with a Kickoff Meeting on February 22, 2016 followed by interviews with key stakeholders. The following stakeholders have a role in the Statewide ITS Architecture and have been interviewed either as part of the Statewide ITS Architecture or as part of earlier county architecture developments. Using the information from the interviews, operational concepts that identify the roles and responsibilities of participating agencies and stakeholders in system operation and implementation were formalized. Agency desires for future ITS were compiled into a project list, with a ten-year horizon. The stakeholders were invited to review the information at a workshop held on May 24, 2016 and workshop input was incorporated into this Final Hawaii Statewide ITS Architecture for agency review and comment. Comments received from the stakeholders are incorporated into this final version of the website. Inventory: Information about the elements or systems that comprise the architecture listed alphabetically or sorted by stakeholder or type of element. Projects: A complete list of the near term (likely to be completed in the next five years) and long term (likely to be completed after five years) organized by project name and stakeholder. Feedback: Use this to provide comments about the architecture to HDOT. 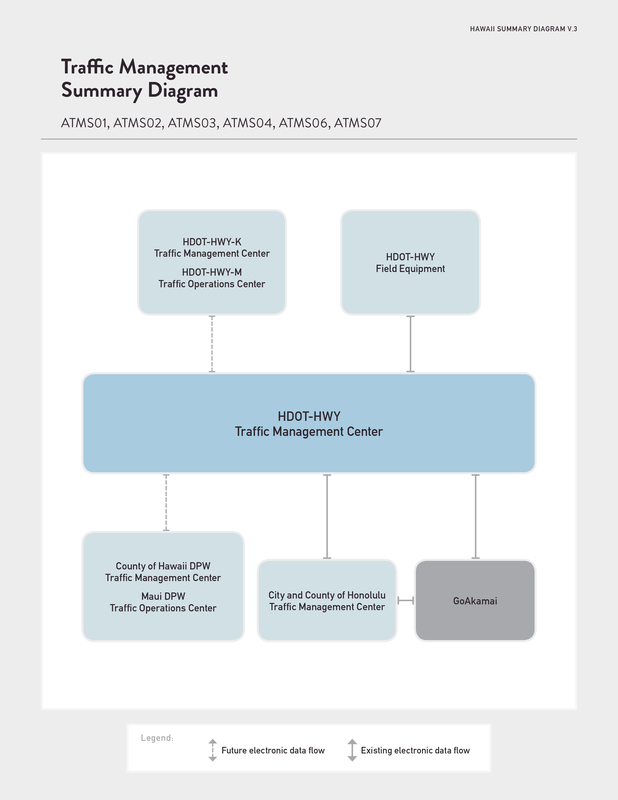 The summary diagram for Traffic Management envisions a future statewide Traffic Management Center (HDOT-HWY Traffic Management Center) that will connect to other HDOT centers and field equipment. In addition, this center could connect to county traffic centers on neighbor islands. Currently, all traffic control is managed on each individual island, either by a single center, such as on the Island of Hawaii, or by a combination of two centers, such as Oahu where the City and County of Honolulu operates county roads and HDOT operates highways. In the near future, all traffic on Oahu will be managed from a single Joint Traffic Management Center. The Hawaii Emergency Operations Center (EOC) is responsible for coordinating disaster management and evacuation management on a statewide level. This includes coordinating information from and between EOCs on individual islands, as well as through the County emergency management centers. The Hawaii State EOC coordinates disaster traveler information dissemination through a variety of streams, including the HDOT Public Affairs Office, and the HTA and HVCB. This summary diagram shows the collection of data -- traffic conditions, advisories, incident information, and the like -- broadcast to the public. The automatically generated information includes images from County and State traffic cameras, incident alerts, and a congestion map. HDOT currently operates and maintains the GoAkamai traveler information system on Oahu and it is envisioned that traffic information from future ITS deployments on neighbor islands will be published on GoAkamai’s website http://www.goakamai.org/and mobile app. 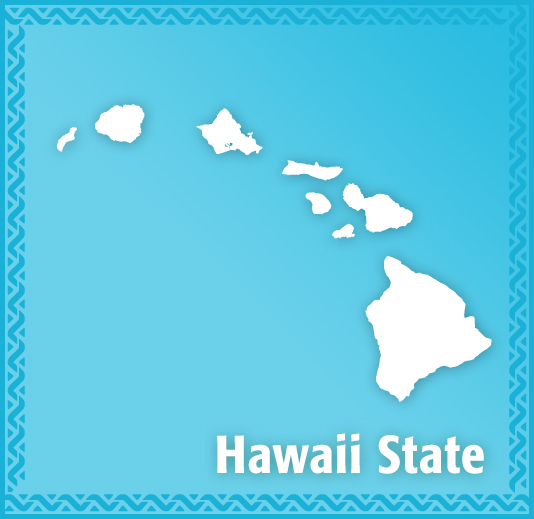 In addition, emergency traveler information can be disseminated to the public through the HTA mobile application and through GoHawaii.com, the HTA website. Connected Vehicles is a next generation technology where vehicles may exchange messages with other vehicles, as well as infrastructure, to improve safety, mobility, and the environment. This summary diagram shows the potential for future connected vehicle applications in the State of Hawaii. 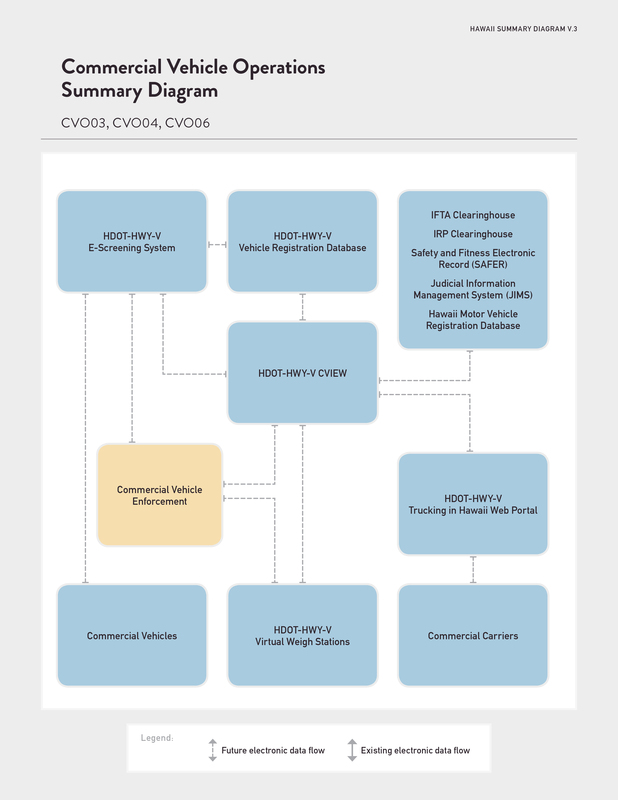 These applications are sourced from the US DOT Connected Vehicles Reference Implementation Architecture (CVRIA), which identifies the key interfaces across the connected vehicle environment. Spot Weather Impact Warning: alert drivers to unsafe conditions or road closure at specific points on the downstream roadway as a result of weather-related impacts. Work Zone Warning: information about the conditions that exist in a work zone to vehicles that are approaching the work zone. Queue Warning: utilizes connected vehicle technologies, including vehicle-to-infrastructure (V2I) and vehicle-to-vehicle (V2V) communications, to enable vehicles within the queue event to automatically broadcast their queued status information, such as rapid deceleration or a disabled status. Connected Vehicle Data for Traffic Operations: uses probe data information obtained from vehicles in the network to support traffic operations, including incident detection and the implementation of localized operational strategies. 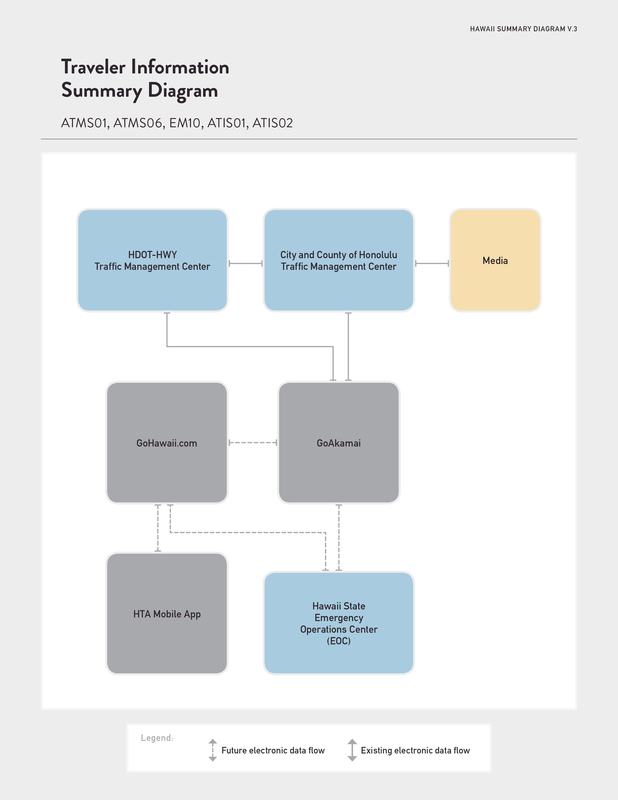 This summary diagram shows statewide Commercial Vehicle administrative systems operated by the HDOT Motor Vehicle Safety Office (HWY-V). 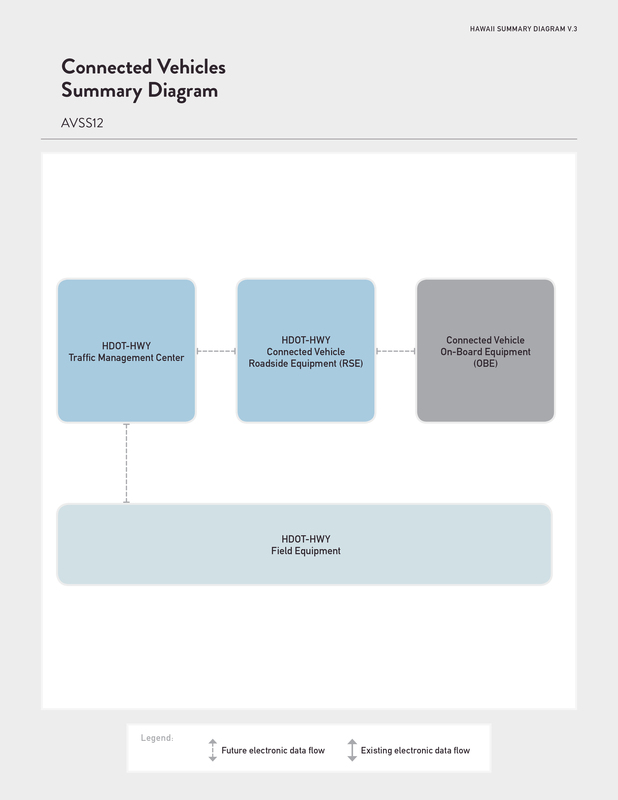 The primary service shown is the HDOT-HWY-V CVIEW system, which will serve as the primary data repository for credential, safety, motor carrier census, and Electronic Freight Manifest data. Once this system is in place, the Motor Vehicle Safety office plans to implement a number of other initiatives shown in this summary diagram, including the Trucking in Hawaii Web Portal, which serves as a single point of access for motor carriers to view commercial vehicle regulatory and enforcement information from all state agencies. Additional initiatives may include E-Screening and Weigh-in-Motion. 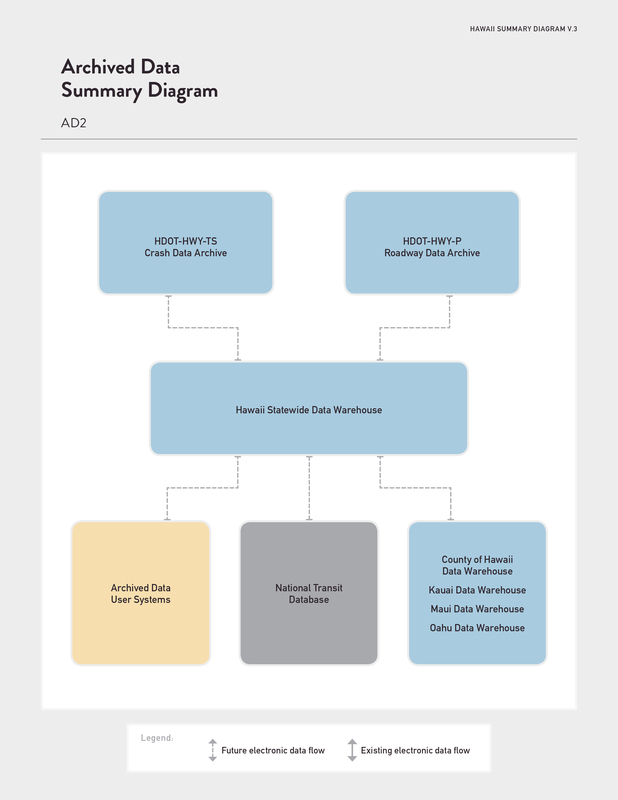 This summary diagram shows the potential for a future Hawaii Statewide Data Warehouse, which would collect archived data from a number of other data archive operating in the State of Hawaii. In the future, these could include individual data warehouses on each island, as well as statewide archives such as the HDOT Highways Division Traffic Branch, Safety Section Crash Data Archive or the HDOT Highways Planning Office Roadway Data Archive. 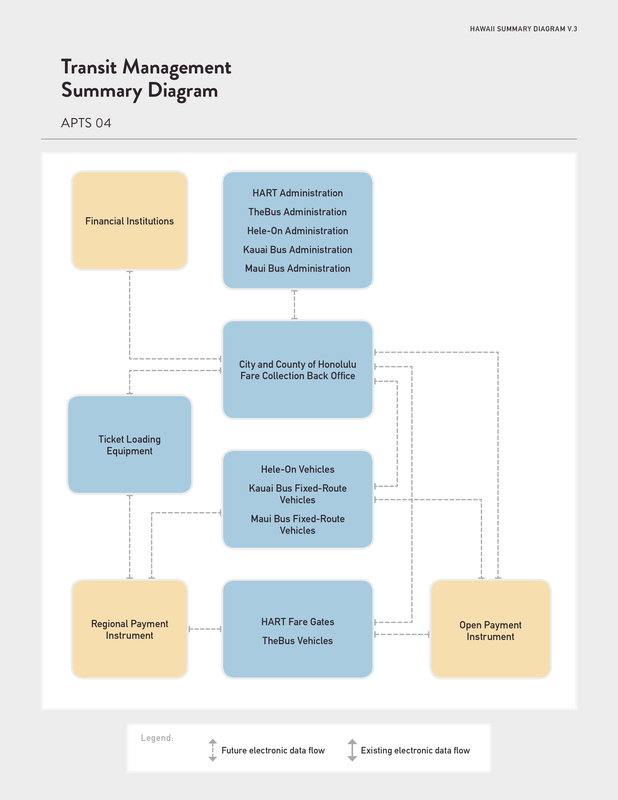 This summary diagram shows a future electronic payment system operating in Hawaii. In a first stage, this system will allow for a single payment method on Oahu. Later iterations may include deployment on neighbor islands. Fares would be reconciled between agencies through a single back office system. In addition, this summary diagram shows the potential for an open payment instrument, allowing transit riders to pay using a chip-enabled device or card.